Today, I will tell you a little bit about a new mini-series which is currently on BBC One and is an absolute must-watch, especially if you're into spy thrillers - and no it's not about James Bond, it's all about The Night Manager. 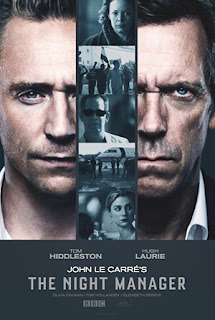 Jonathan Pine, a night manager from an hotel in Cairo is recruited by intelligence agents after he gets involved in events concerning the international arms dealer Richard Roper. He is meant to infiltrate Roper's network to uncover his trades. The six-part series is nerve-wracking, thrilling and beautifully made. It is the best John Le Carré adaption I watched since Tinker Tailor Soldier Spy back in 2011, if not even better. I love that John Le Carré's story is transferred into modern days, because the series gains relevance through this. Illegal arms trading is still a problem as we can see with all the horrible things happening in Syria and all over the world. The thiller is somehow eye opening and very upsetting - it's facing so many issues and is really addictive. In addition, the cast including Tom Hiddleston (Thor), Hugh Laurie (House) and Olivia Colman (Broadchurch) is outstanding. Especially, Tom Hiddleston, who I already really enjoyed in Thor and War Horse, but I love him in this role, he's brilliant and this performance makes me wish those James Bond rumours would come true because he would be great. Back to The Night Manager, the director Susanne Bier (In A Better World) turned the story into a fast-paced, visually intriguing drama. I must say I've been into Le Carré's spy novels back in school already and I got quite excited when I heard that the BBC is making a new series based on one of them. Now I've seen (most) of it, I certainly wasn't let down - it's brilliant and I'm saying that without having seen the last episode yet, which I'm quite sure is going to be impressive as well. I can't wait to see how it all turns out on Sunday night. in Germany you will be able to stream the series on Amazon Prime from the 28th March or pre-order the DVD here . The series will also air in lots of other countries on the AMC network, so don't worry if you're not from one of the countries above. 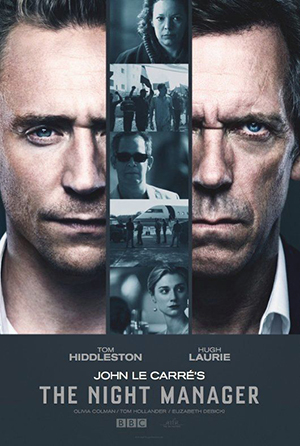 Conclusively all I've got left to say is: Watch the trailer for The Nightmanager below and get watching, it's worth it! And when you watched it, let me know what you think in the comments below.